e-Fuel vs. UCAN Sports Drink Comparison. Super Starch or Maltodextrin? e-Fuel is less than half the price of UCAN and e-Fuel is all natural with NO artificial colors, flavors or sweeteners. UCAN uses what they call “SuperStarch” which is corn starch that they claim has significant advantages over maltodextrin. Both SuperStarch and maltodextrin are complex carbohydrates from corn and to date there has been one study that examined the performance benefits of SuperStarch(2). In the study, nine competitive cycled at a workload prescribed to 70% of their VO2 peak. After 150 min of steady state exercise, the workload was increased to 100% VO2 peak until the subject could no longer maintain a minimum pedal cadence of 50 revolutions/min or the subject’s power output decreased greater than 10% below the prescribed workload. Essentially, they were doing a test to exhaustion and seeing if the SuperStarch would produce greater results than Maltodextrin, which they used as an active control. What happened was surprising; the Maltodextrin produced a similar (actually slightly higher) glucose response during the time trial, but a far greater glucose level during the after-cycling recovery period (when a second drink was consumed). Does UCAN bother your stomach? UCAN contains Xanthan Gum and Gum Arabic that according to WebMD can cause gas, bloating, nausea, and loose stools (read side effects). 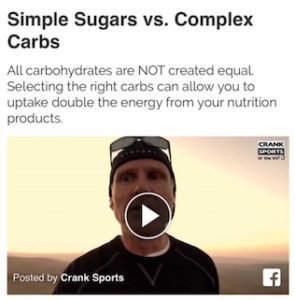 e-Fuel doesn’t use these ingredients or sugar substitutes (such as those found in Hammer HEED, Cytomax, etc.) that can have similar side effects. Fiber slows the digestive process and can also cause stomach distress during athletic activity. Using ingredients that cause stomach distress is the last thing that an athlete would want to deal with, so none of these ingredients are found in any of our products.